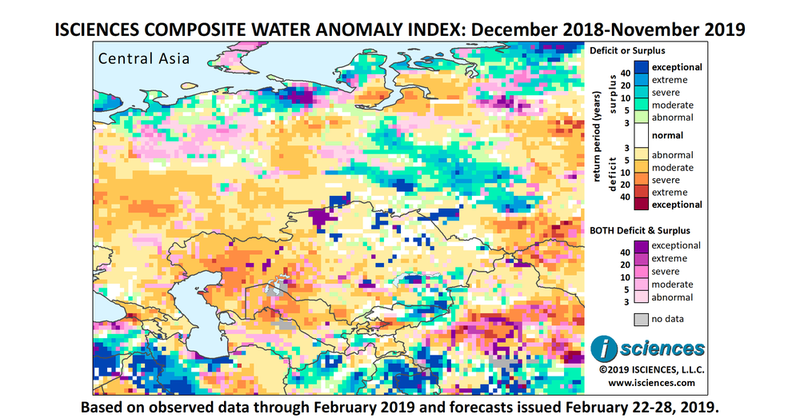 The 12-month forecast through November 2019 indicates moderate to severe deficits in the Volga River Basin’s Middle and Upper regions in Russia, and moderate to extreme deficits in the bulk of the Yenisei River Basin. Surpluses of varying intensity are forecast in the Middle Ob River Basin and in the northern portion of the Tom River Basin in Russia. Moderate to severe deficits are forecast for northern Turkmenistan, central Uzbekistan, and western Kazakhstan. Severe to extreme deficits are forecast for the Fergana Valley in eastern Uzbekistan reaching across Kyrgyzstan’s narrow girth. Surpluses are expected in eastern Kyrgyzstan and could reach exceptional intensity. Surpluses are also forecast in Kazakhstan south of Lake Balkash, scattered pockets in northern Kazakhstan, and western Tajikistan. The forecast through May indicates that surpluses in the Ob River Basin of Russia will shrink somewhat and downgrade, with exceptional surpluses nearly disappearing. In the Yenisei River Basin, deficits are forecast in the lower reaches; surpluses along the Kureyka River, an eastern tributary; and deficits in the regions of the Lower and Podkamennaya Tunguska Rivers, and Angara River. Moderate to severe deficits are forecast in the Middle Volga River Basin and moderate deficits in Trans Volga and in the southern Ural Mountains. Moderate to exceptional surpluses are forecast for scattered pockets in Kazakhstan, particularly in the north, south of Lake Balkash, eastern Kyrgyzstan, and western Tajikistan. Moderate surpluses are expected in southern Turkmenistan and southeastern Uzbekistan. Severe to extreme deficits are forecast in the Fergana Valley in Uzbekistan and across Kyrgyzstan’s narrow girth; moderate to extreme deficits in central Tajikistan and southern Kazakhstan; and moderate deficits in central Uzbekistan and pockets of northwestern Kazakhstan. From June through August, severe to extreme deficits will emerge in Turkmenistan, Uzbekistan, and western Kazakhstan, with pockets of exceptional anomalies. Deficits in the Fergana Valley will moderate; severe deficits will persist in a narrow band in central Kyrgyzstan; and severe deficits will emerge in southern Qaraghandy Region, Kazakhstan. Surpluses will persist in eastern Kyrgyzstan and across the border into Almaty Region, Kazakhstan. In Russia, deficits will persist in the Volga Basin, and conditions of both deficit and surplus are forecast for the Northern European Plain. Surpluses will persist in the Upper Ob River Basin and deficits will increase in much of the Yenisei River Basin. The forecast for the final months – September through November – indicates that deficits will shrink in the Volga and Yenisei Basins and downgrade overall in Central Asia. Surpluses will persist in eastern Kyrgyzstan and in the Ob River Basin. Turkmenistan is creating an artificial lake in the Karakum Desert for collecting drainage water from irrigation in hopes of expanding pasturelands and other cultivation areas and relieving problems like soil salinization, waterlogging, and drought. Officials in St. Petersburg, Russia called for a state of emergency early last month when heavy snow caused dangerous conditions and a man was killed by a falling block of ice. The city received more than double the usual amount of snowfall for that time of year, causing tensions to flare between city residents and municipal officials, and between municipal officials and higher authorities. Residents picketed municipal offices and demanded military intervention to help deal with icy roadways and mountainous snow piles. Officials deployed 7,500 people and nearly as many vehicles in the snow removal effort.